This was tremendous fun from start to finish with not one of those Numpty moments when we disagree about our solving method and one of us stomps off to cook the supper. Well, in fact, the other Numpty was solving so quickly that all I could do was sharpen pencils, slot in the solutions and work out what the extra letters were saying. Some great clues emerged. My favourites were 10 and 39 down: ‘Former heretic raised youth under Buddhist [esotericists] misleading prophet with thanks for American gum (6)’ leading to ZENDIK (ZEN + KID (rev)) and (BALAAM with TA replacing AM). Those will be this week’s words to drop idly into dinnertime conversation. Soon enough those extra letters had an intriguing M D EAS I OHU and an anagram solver told us the astonishing fact that the HOUSEMAID was the killer. 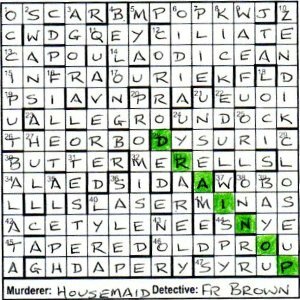 Down clues had produced KILLER FIRST THEN UNUSED LETTERS so what looked like insoluble codes proved to be magic and in no time at all, we learned that WIMSEY, F(athe)R BROWN and MAIGRET had all offered statements about where the body was. Well, we could see the BODY floating on BUTTERMERE (that’s a truly beautiful lake in the far reaches of the Lake District not far from the village I grew up in) so we were not very surprised that it wasn’t MAIGRET who solved the crime with his BOTTOM OF GARDEN. WIMSEY’s DRAPED OVER FLOOR might have been easier for the maid than rowing out into the middle of Buttermere but FLOATING ON LAKE was clearly the description of what our grid showed since the body was ‘draped over‘ EDEN which seemed to be the only garden in the grid, and actually ‘under‘ GROUND which seemed to be the only floor. It remained for us to find a murder weapon. 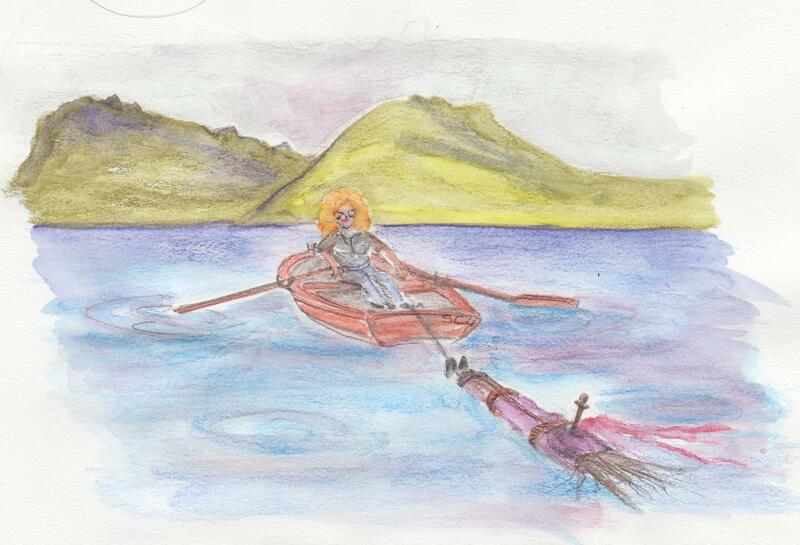 What on earth was the housemaid doing killing with a poniard and floating the body out onto Buttermere? I don’t suppose we’ll ever know but it was tremendous fun, Hedge-sparrow. One of my favourites of the year so far. Four of Hedge-sparrow’s previous five Listeners have had a scientific theme. Although you shouldn’t necessarily infer too much from a Listener title, the preamble did seem to confirm that Hedge-sparrow had now entered the world of Poirot, Holmes and Morse. There was a murderer to be identified, and a victim to be found, as well as a code to be unravelled. Three detectives would appear (coded in the grid), each of whom had some profound words of wisdom (coded in the preamble). Finally the murder weapon would need highlighting (coded?). The across clues had nine of the DLM+1 type (definition and letter mixture with an extra letter), which I think is a fairly recent innovation. My initial reaction was that this type was somewhat unfair, but they aren’t actually too difficult … although I suspect it depends who the setter is. And so, after dispatching 12ac CILIATE (courtesy Mrs B), 13ac Map confused head of Mafia branch proved to have quite an easy definition and gave CAPO, with M as the extra letter. 15ac Find a reference further down page was also a DLM+1 and gave INFRA. A flurry of solving followed, with 17 OURIE, 19 PSI, 22 EUOI and 23 ALLEGRO. However, apart from 38 OBO, that was the end of my across entries. The down clues were a different type, each being two clues run together separated by an extra word; these which would provide a message from their first and last letters. 3,37 was Thin women I watch enter Greek marketplace from the north, all bearing silver and gold (5). The first part was a reasonably easy WISPY, and ‘Greek marketplace’ positively shouts AGORA. With CAPO and INFRA in the top left, this enabled both to be safely positioned in the grid and ‘enter’ identified as the extra word. A lot of the down clues were straightforward, including 4,33 BELONG & RARELY plus 5,43 MYA & NOR and 8,31 TESTED & LICKED. The trickier ones were soon slotted into the grid with the help of the across entries, which I generally found more elusive. Identifying the BODY (or is it THE••BODY) in the central row, we see that Wimsey is wrong because it is at the top of the garden (EDEN in column 8), and Maigret is wrong because it is under the GROUND (in row 6). 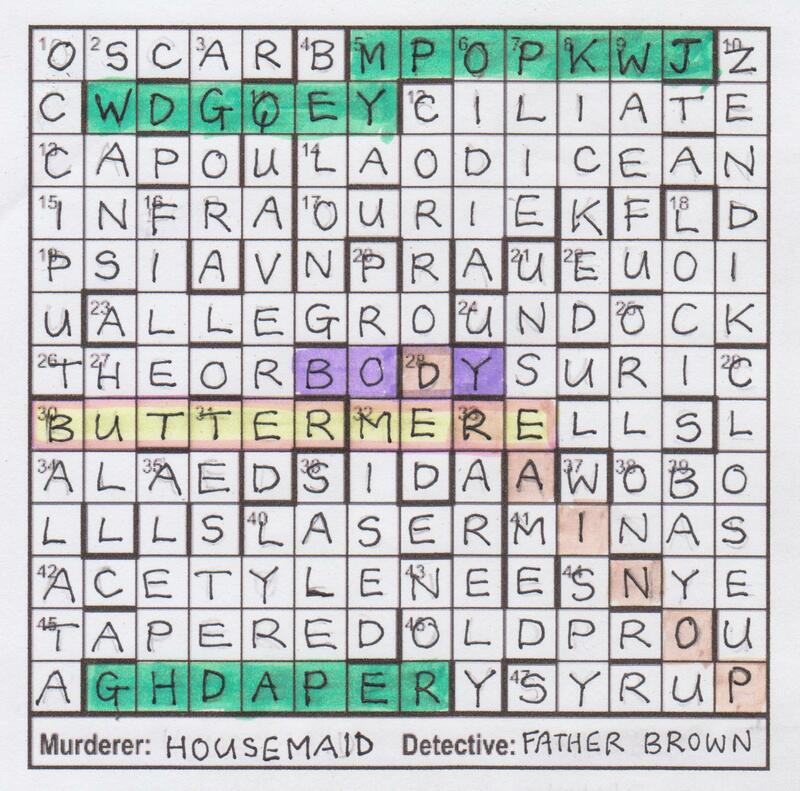 This means that my nemesis (thanks to Dysart) Father Brown is the correct detective since the body is indeed floating on lake BUTTERMERE (in row 8). All that remained was to highlight the murder weapon, and that could easily be seen in … erm … umm … oh, where is it? Don’t tell me it is in code after all! Luckily it wasn’t, and I eventually identified PONIARD running NW from the bottom right corner. Thanks to Hedge-sparrow for an entertaining murder mystery which helped us to put away that dastardly housemaid. Five weeks before we had Kea’s Polar with its opposites. This week we had clues that were either true or contained a lie. I guessed that lies here would not be the same as Kea’s opposites. I was intrigued (but also annoyed that the clues weren’t numbered … again). I decided to colour the start of each clue with green for those that were true, red for those that lied and orange for those alternating. Unfortunately, and somewhat predictably, orange and red turned out to be annoyingly hard to distinguish. It looked like I was on course for getting quite annoyed this week. I looked at clue 1: You formally heard old buck’s second to last in dog race (7, two words). Well, it seemed to me that a lie could be ‘you’ instead of ‘I’, ‘second to first’ instead of ‘first to last’ or ‘last to first’, or ‘dog race’ instead of ‘horse race’. Aha, horse race, two words, could be THE OAKS, and so it was, with THE (sounds like thee) + SOAK with S (second) moved to the end. I chose to put it in the right hand grid; this would be for all false clues or for the mixtures. Clue 2 contained ‘75%’ so that could be ‘25%’ or ‘50%’, or indeed anything in between. Moving to clue 3 and that was ANNULET and could go under THE OAKS to give down entries beginning TA, EN, OU, KE and ST, all of which were common enough starts of words. I pencilled it in. Clue 4 Likewise Elfman: a nobody and the opposite of ‘nobody’ could be ‘somebody’ or SOMEONE (SO + ME + ONE). I guessed at the left hand grid for this one, although whether it was in the top row or the second would only manifest itself a bit later. BELT, ETAL and GHEE came next, and then 15 Title of respect to glorify and then elevate (6). UPRAISE didn’t take long, and the lie here was the clue length. 18 was AMULET and the first true 6-letter entry which had to run down from the top row and probably fixed SOMEONE in row 2. TABANUS, possibly running down from THE OAKS and through BELT was followed by EN L’AIR, LEFTIE, ODEA and HAPU. Lot’s of great clues and neat little lies. Across the bottom of my right-hand grid, I could see SUSPECT, representing the alternate clues, and a short time later, the central row emerged as A HALF TRUTH IS A WHOLE LIE, and my grids proved to be back to front. A short while later and the puzzle was complete. UPRIGHT was in the central column of the correct clues’ grid with ANANIAS across the top of the lies’ grid. Ananias of Damascus appears in The Acts of the Apostles. He lied about the price he paid for a tribute to God, a crime for which both he and his wife were, rather extremely in my view, struck down dead. OK, so he lied to the Holy Ghost, but still! And so, thanks to Elfman for a fine little puzzle, no word of a lie … honest! PS: Those eagle-eyed among you will find the cause of a final bit of annoyance hidden in this week’s animation! PPS: Hello to all those I met at last week’s Listener Setters’ Dinner. Thanks to everyone for making it great fun, and especially to Jim and Jan for another feat of organisation. Numpty consternation when not one but three little cartes blanches rolled off the printer. We counted the clues and found 36 but we had 42 lights in the three grids, 14 in each, so it didn’t take us long to realize that the ‘6-word version of a proverb’ was going to cross the centre of the three grids. And we remembered to highlight those words in the preamble that said that ‘in each section one appropriate 7-letter entry is unclued’. Solving was enjoyable as, apart from the devious tricks Elfman resorted to to put ‘exactly one lie’ into each lying clue, these were relatively straight-forward clues. A few of the clues had us flummoxed at first with regard to whether they were truths or lies. ‘Against being scantily clad — doubly so (4)’ is one example. Clearly we were removing two letters from each end of SCANTILY to give ANTI, so that seemed to be ‘True’ and it was only in retrospect that we realized that the word was actually being UNCLAD, making that one a lie. That was, of course, after we had fitted all our answers into grids and checked whether they behaved as they should, producing one true grid, one lying one, and one that strictly obeyed the rule of alternating between truthful and lying clues. Aaah, those devious tricks! An anomaly had appeared when we attempted to split our clues into acrosses and downs. A simple count revealed that we had one extra 6-letter clue that seemed to belong to the acrosses (where there were no 6-letter clues) and one 7-letter down clue missing. Could the editors have let an error through? Nooooo! We know them too well for that. The culprit was staring us in the face. ‘Title of respect to glorify and elevate (6)’ It had to give U+PRAISE in our lying and truthful grid, but it also came between two obviously ‘True’ solutions ET AL (‘Lose millions from gold perhaps and other things’ (4) METAL less M) and TABANUS (‘Cheers prohibition on American gadflies (7)’ TA + BAN + US). Thus the UPRAISE clue had to contain ‘exactly one lie’. Penny drop moment! The word count! Once we had spotted that, we were on the home-straight. (There were a few horsey clues in this, and doggie ones too, weren’t there and a surprising lack of the usual Listener compiler alcohol! Even I know that THE OAKS – clue one, is not a dog race!) However, the deciphering of the wordplay took a while: I now know that to BUCK was once to SOAK, and, of course, the S(econd) had to go to the end of the clue. How wonderfully that clue misled us. I was back with Jack London and his Buck in The Call of the Wild, though he would hardly have come second to last in any dog race – he’d be more likely to have eaten the winner. Of course, we had looked, right at the start, for ‘Truth’ quotations in the ODQ but there are rather a lot. Still, the right one soon emerged: A HALF TRUTH IS A WHOLE LIE, and checking in Chambers told us that this was not another bit of Elfman trickery. Half-truth does have that deceptive hyphen that some crossword editors indicate, but naturally not the Listener – that would make our hoop-jumping activities too easy wouldn’t it? It remained to find those three appropriate words, one in each section. Sure enough, they were exactly where we might have suspected. One right down the centre and the other two symmetrically placed. Nice, Elfman! This was an enjoyable romp. I wrote Elm before Small but Perfectly Formed (Listener 4176). Unfortunately (for me) Kea’s excellent Table-turning (Listener 4100), also involving a grid dissection, was published while I was in the middle of writing Elm, and I decided to postpone sending it in for vetting. Even so, it stayed in the pipeline for a while to ensure a seemly gap between the two puzzles. The idea behind the puzzle had been the subject of many idle doodles. Sorted by longest side, the first three ‘primitive’ Pythagorean triples—ones that aren’t just multiples of other ones—are (3, 4, 5), (5, 12, 13) and (8, 15, 17). Now 52 is far too small for a Listener puzzle, and 172 is probably too big. But 132 is just in the Goldilocks zone. Among the doodles I had a couple of dissections of the 12-by-12 square into three pieces that could be reassembled into the 13-by-13 square with the 5-by-5 in the corner. (Exercise for the reader: can it be done in two pieces?) Here they are, displayed, as seems traditional on this site, as animated GIFs. It’s nice to have solvers get the scissors out, but the problem is how to indicate the intricate pattern required concisely. I hit upon the vaguely apt idea of using deleted letters in entries to indicate where the scissors should go, taking advantage of the natural correspondence between the points where letters are omitted in lights and grid lines. Deleted letters give a medium for a message as well as making the clue answers longer, always a good thing. Once the basic structure had been sorted out I got the computer to look for suitable bar patterns. Just as carpenters don’t like exposed end grain, I wanted to avoid bars on the edges of the grids or coinciding with cuts. A symmetric final grid would give solvers struggling to find the last few cuts an alternative angle of attack and anyway is more satisfying. Trying some candidate grids with a slightly modified version of Qxw’s filler, I found that the first dissection was likely to be a much harder fill than the second, probably because there are more cut edges and hence a greater fraction of the answers have to be of the more constrained ‘skippy’ type. Nevertheless, even filling the second grid wasn’t easy: for example I couldn’t find a satisfactory fill with a message starting ‘cut along grid lines by deleted letters’ instead of ‘cut along grid lines by skipped letters’. With the second dissection the top left of the grid is relatively unconstrained. The fill I had found placed several of the less friendly letters in the top and bottom right, and with a bit of rip-up-and-retry it was possible to mop up the rest in the top left and make the fill pangrammatic. Permuting the skippy clues and interleaving them arbitrarily with the others to spell out the message gains some freedom in the grid fill. Not numbering the clues covers up the resulting untidiness; and writing the skippy clues so that they appear in alphabetical order compensates a bit for the extra difficulty at the cost of making life harder for the setter, which is as it should be. It seems possible to write a clue for pretty much any word with pretty much any given letter as the correct form of a misprint (though it’s much harder if both misprint and correct form are specified). I could therefore present these in alphabetical order of answers, with the result that solvers who read the preamble carefully would be able to deduce the type of most of the clues from the outset. The reaction of the vetters was fortunately largely positive, though the original preamble underwent drastic pruning and some clues were shortened to have a better chance of fitting on one line. Early feedback on That Site and by e-mail indicated, as expected, that people were finding the puzzle a bit harder than average. But most seemed to think it was worth the effort, which is very gratifying. What I hadn’t expected was that many solvers completed Grid B first: since the grid wasn’t given I thought that almost all would leave it to the end. Many thanks to the test solvers who persevered in the face of a draft that was far too difficult; to the vetters for all the improvements they made; and to all who commented on the puzzle after publication. I greatly value your feedback.